HSS BiMetal PLUS hole saws with variable- (0904) and constant (0905) pitch. This tool is provided with a hex of 10 mm on one side and a hex of 8 mm on the other side. The transition hex makes it possible to enlarge an existing hole <30 mm to a hole of ≥ 32 mm. Centre drills for Multi Purpose hole saws Click&Drill®. for Multi Purpose hole saws (0908), cutting depth 52 mm. Size 1 (hex 8 mm) for hole saws 16-30 mm. Size 2 (hex 10 mm) for hole saws >32 mm. 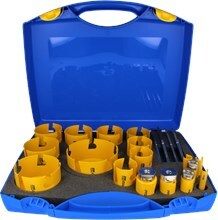 Multi Purpose hole saws sets with TCT teeth and an integrated Click&Drill® adapter (0908). To be used in wood, particle board, MDF, bricks, plastics and tiles (with a hardnes upto 4). The TCT tooth are regrindable. Quick change of the hole saw. Easy removal of the plug. Drilling at an extreme angle. Sizes (see composition). Other compositions on request. Multi Purpose hole saws with TCT teeth and an integrated Click&Drill® adapter (0908). To be used in wood, particle board, MDF, bricks, plastics and tiles (with a hardness upto 4). Size 1 (hex 8 mm) with HSS drill = DDH1MP DDH1XLMP for use in wood ect. Size 2 (hex 10 mm) with HSS drill = DDH2MP DDH2XLMP for use in wood ect. Size 1 (hex 8 mm) with TCT drill = DDH1MPCT DDH1XLMPCT for use in bricks ect. Size 2 (hex 10 mm) with TCT drill = DDH2MPCT DDH2XLMPCT for use in bricks ect. and HSS Bimetal PLUS hole saws with variabele (0904) and constant (0905) pitch. SDS adapters for the Click&Drill® centre drills. for Multi Purpose (0908) hole saws with a cutting depth van 52 mm and HSS Bimetal PLUS hole saws with variable (0904) and constant (0905) pitch.